The galaxy with the long tail is located in the galaxy cluster Abell 370. It is shooting out an immense stream of red gas and blue star-globs, which looks like a dragon’s tail. 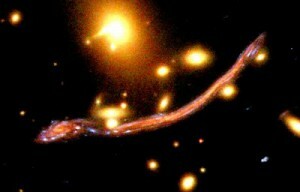 The tail threads between three small galaxies, partially encircling a large elliptical (upper fuzzy glob). Micro galaxies are also emerging (some at the end of jets) from the large, orange elliptical. Today’s telescopes reveal deep vistas of possibly a trillion galaxies, at many ranges, to the creation era. According to Psalm 19, the plural heavens (Hebrew shamayim), the things that spread out (Hebrew raqia), reveal God’s glory day and night. They declare the work of his hands without words. What is visible fits the literal Hebrew text of biblical creation. Scientists are highly trained to interpret the universe with a dogmatic first principle, which they accept as self evident. This historical assumption is the basis for many of their definitions, empirical measuring units and laws of physics. This web site encourages you to test the foundational assumption of science with the visible history of the universe. I recommend that you first read the section on principles. Once you have learned how to question science’s elementary assumption, you will be free to accept cosmic history as we see it in the light from the only history that is visible, cosmic history. What is visible fits the seven days of creation like a glove. No visible evidence exists for the 99% undetectable scientific universe. Scientists tell stories about how a tiny bit of vacuum exploded and created everything out of nothing. They imagine that 84% of all the matter in the universe is invisible. They speculate that the vacuum of space time is stretching light passing through the void. They even proclaim that 70% of all processes in the universe involve the accelerating, spreading of space time. (No one has detected any space time.) They even claim that stars gravitated from space dust, when the opposite is visible. Please read the literal seven days, translated directly from the Hebrew text, from the left menu.